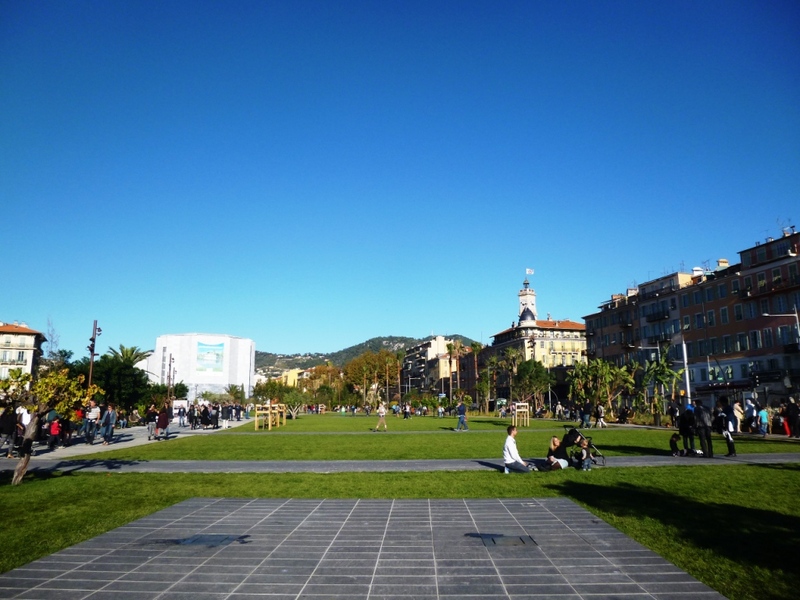 The opening of the Promenade du Paillon pretty much marks the end of around 10 years of building work undertaken by successive mayors to improve the quality of life and infrastructure in Nice, including a new tram network leading to the rejuvenation of avenue Jean Médecin, Place Massena and Place Garibaldi and the demolition of the old bus station and car park which was a total eyesore and scarred the town centre architecturally. This was located on the bed of the Paillon, a mountain torrent that flows down from its source high above Lucéram in the Southern Alps and separates Old Nice from the new town – you can easily see the difference in terms of the architecture – and which due to numerous devastating floods was covered up in various stages between 1868 and 1972 over around a mile between the start of the city centre and the Promenade des Anglais where the Paillon hits the sea. When the bus station – which along with the neighbouring multi-story car park was a 1970s concrete monstrosity blocking the view over the old town complete with some dreadful “hanging gardens” (definitely not of the Babylonian variety) – was finally demolished in 2011, the council decided to create a different and better quality public garden area which evolved into today’s Promenade du Paillon. The first thing that I must stress is that the Promenade du Paillon isn’t a tourist attraction in itself and there’s no reason to go out of your way to check it out if you’re just a tourist, it’s a little bit like Hyde Park in London, a place for locals to go out for a stroll during the weekend and for kids to play… But it’s in a stunning setting and it seems to be pretty well-maintained and safe, so if you’re a tourist, you’ll probably be passing through there given the central location so you may as well walk through. 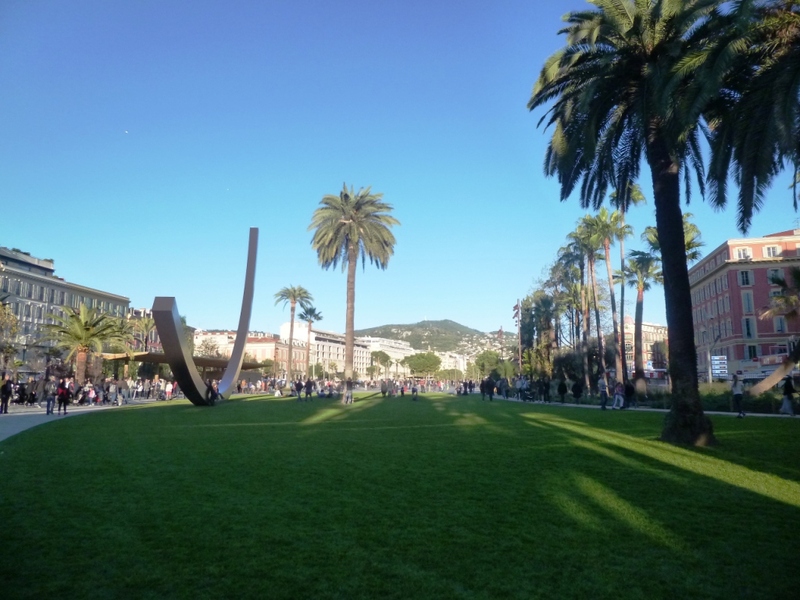 You can start the walk on the Promenade des Anglais, where the Paillon hits the sea – head up through the gardens, past the Théâtre de Verdure where the Nice Jazz Festival now takes place every summer after moving away from Cimiez and past the bizarre upside-down arch shaped sculpture, then head up to Place Massena and its lovely red arcades which were recently renovated in a contemporary manner, where the Promenade du Paillon really begins. You’ll first encounter the 3000m2 “water mirror” attraction which you can walk through but be careful, it’s dotted with fountains that launch in random patterns, soaking everyone in the process – probably great in the summer or on a warm day but not so fun in the winter I suppose, so walk through the basin at your own risk! 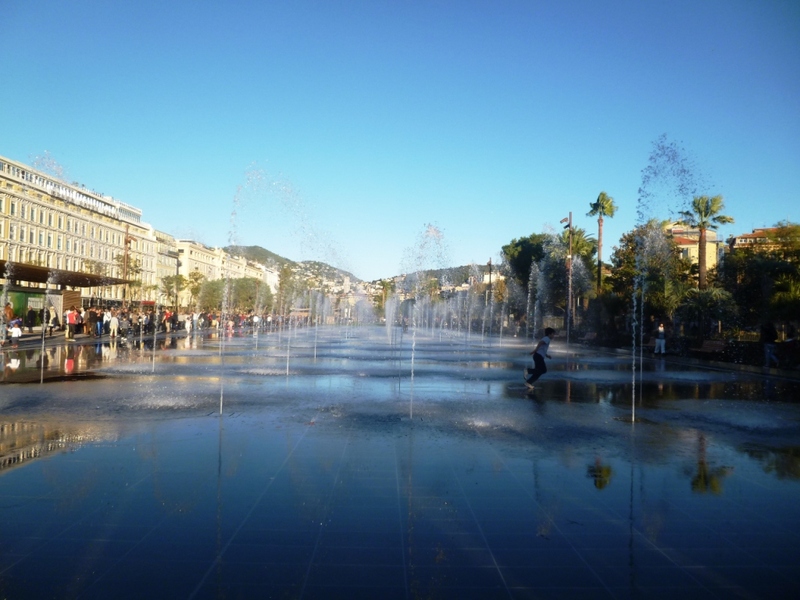 There are also lots of smaller “soaking fountains” for kids elsewhere on the promenade. 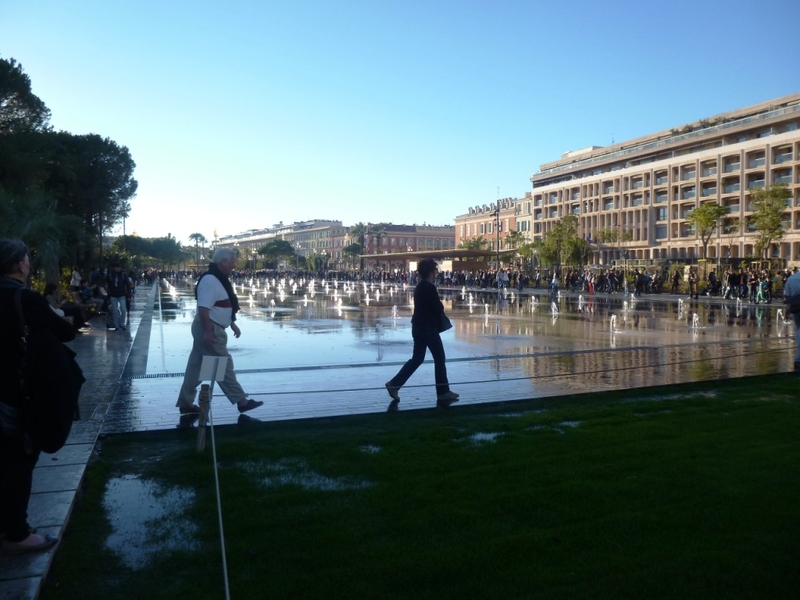 The new water mirror fountains, walk through there at your peril! 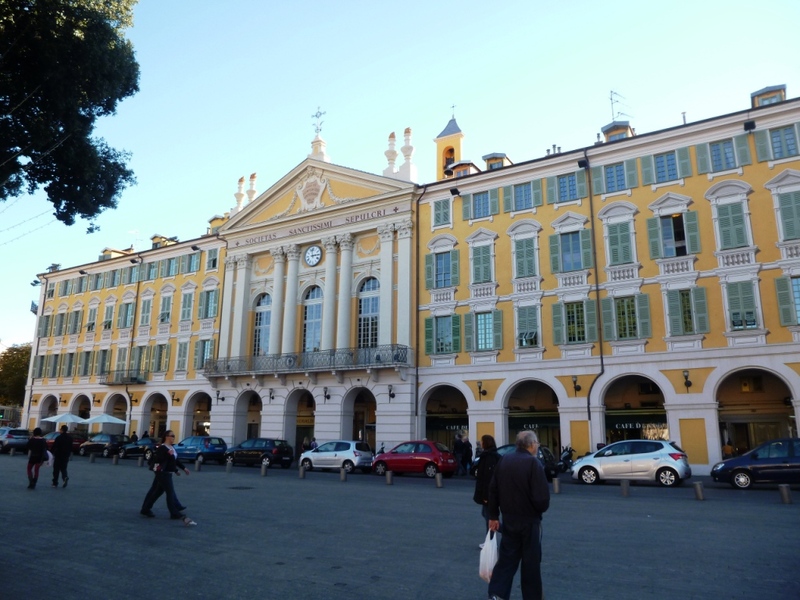 As you head up, past the rather original wooden children’s playground games shaped like various animals, you’ll be able to admire the rather original 19th century architecture of the Lycée Massena, the top high school of the city to the left and the lovely colourful architecture and baroque church spires of Old Nice to the right. There are also several exhibits indicating what the Paillon river bed looked like before it was covered up… It’s hard to imagine that a about a century ago, there were several bridges where the garden is currently located and that the local ladies used the bed, which was dry most of the time, to hang up their laundry to dry! Finally, around the bend of the river bed, you’ll reach the tip of the garden and find the modern building complex housing the National Theatre of Nice and the Museum of Modern and Contemporary Art (which is free and worth a visit if you like that kind of stuff, but I don’t, so I won’t go into any detail about it!). 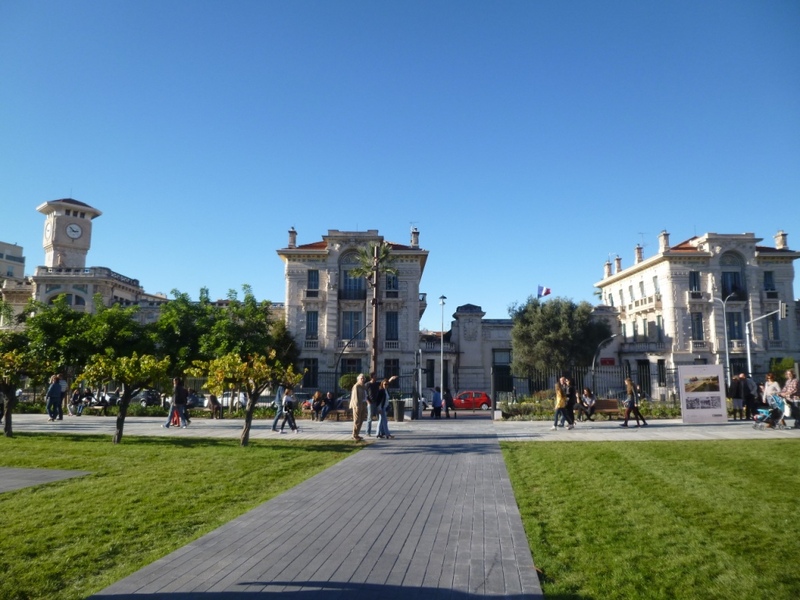 To get another idea of the Promenade du Paillon aside from my description, you can check out this propaganda video made by the city council – but, to give them some credit, they did do a good job. The Promenade is open every day until pretty late, but you’ll see that there is a whole bunch of things which aren’t allowed and there are plenty of council staff to make sure the rules are respected – which is probably a good thing as they want to keep it as a family destination and not as a playground for yobs. If you’re still up for it and have already visited the Old Town, I’d advise you to carry on in the same direction, slightly to the right, and walk past Place Garibaldi, the recently renovated square (which was previously quite shabby) dedicated to the Italian freedom fighter who was born in Nice and its pretty arcades, then take the street that heads along the side of the Castle Hill behind the port (rue Catherine Ségurane) and climb up to enjoy the rather particular atmosphere of isolated peace and quiet in the heart of the city (which I also discuss in my “Essential Nice” article. The beautiful Castle Hill juts out of the otherwise flat landscape of central Nice a bit like the Acropolis or Lycabetus hills in Athens (though the Castle Hill is a little bit greener) and is named after a large fortified castle that stood until the late 17th century when it was dismantled upon the orders of Louis XIV of France, the so-called Sun King. 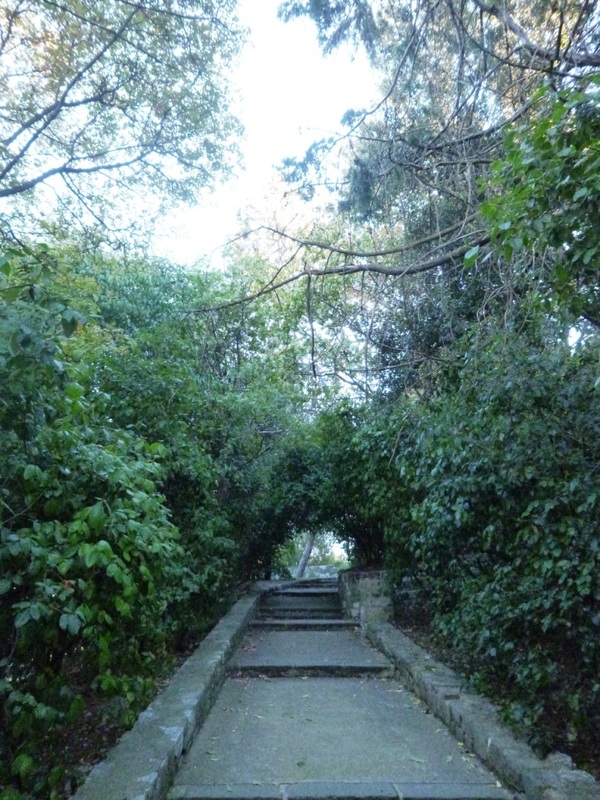 It was then redeveloped in the 1830s by King Charles-Felix of Savoy who decided to take advantage of the amazing view from the top of the hill and therefore to redevelop it by placing a landscaped park and an artificial waterfall in order to attract tourists from the European aristocratic circles. The relatively smooth slope on this side isn’t too strenuous to walk up and will take you through some picturesque tree-lined paths and through the park gates (it’s generally open during daylight and dusk hours, you wouldn’t want to go there after dark anyway) up to the top of the hill, which you will eventually reach: I’m saying eventually because signposting isn’t the greatest but all the paths lead to the top so just follow that general direction. 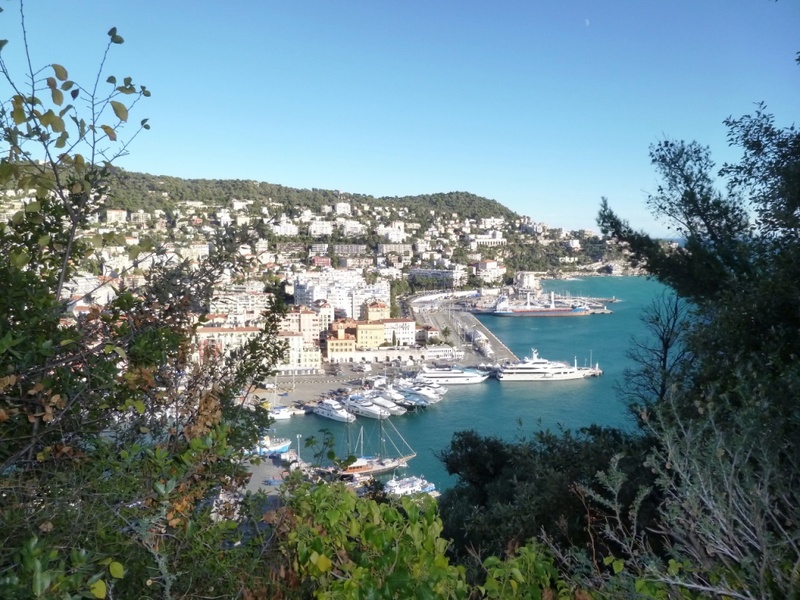 Once you’re at the top, the best advice I can give you is to wander around the different viewpoints: first visit those facing east towards the port, affording great views of the Cape de Nice, the “Port Lympia” harbour and the Mediterranean. 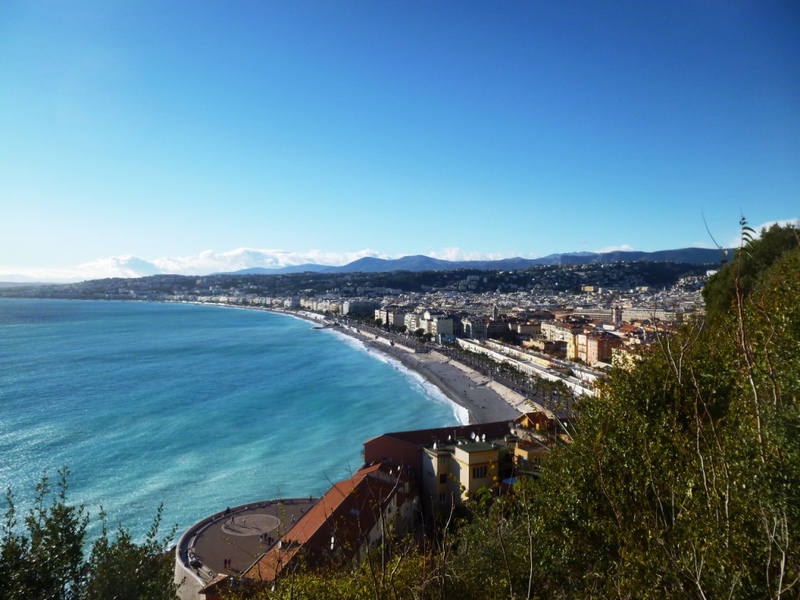 Then head to the more westerly viewpoints which have an absolutely superb picture postcard panorama overlooking the Promenade des Anglais, Old Nice and the Baie des Anges, with further in the distance the Cap d’Antibes, the Esterel mountains, the airport and the Southern Alps: this view is best enjoyed in the morning in order to avoid the sun directly facing you in the afternoon. 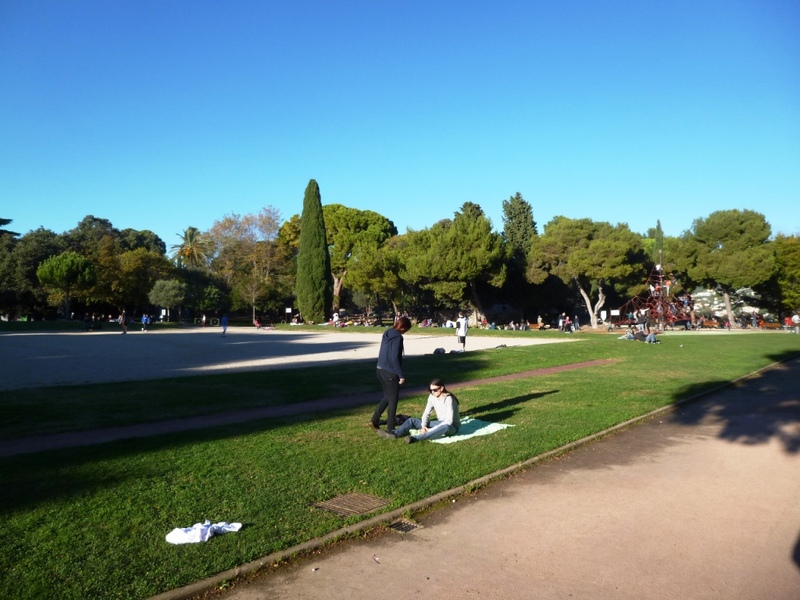 The plateau also has a small snack bar and a leisure area for children to have fun, as well as some pretty mundane archaeological ruins of the castle church foundations. 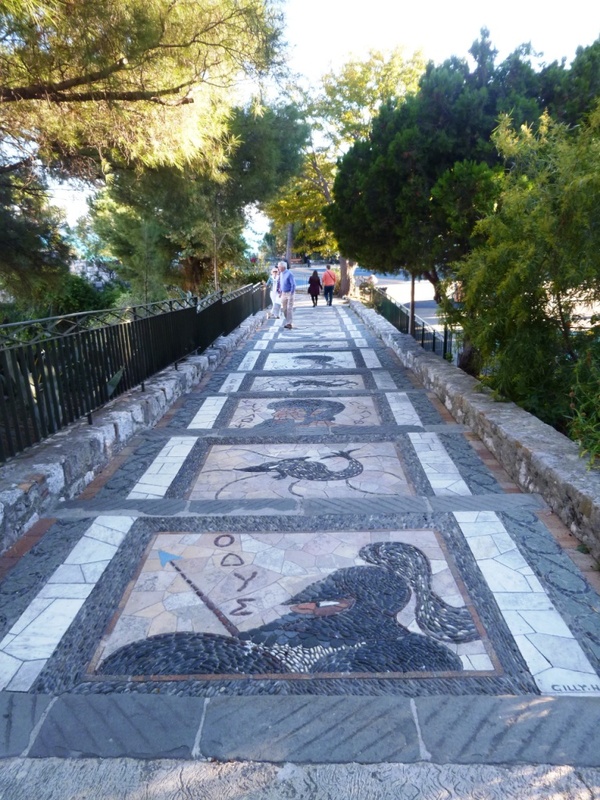 Finally, it’s worth checking out the beautiful waterfall that dominates the hill when you view it from the old town (at the top of another un-signposted staircase to the right of the path leading around the western side of the hill). 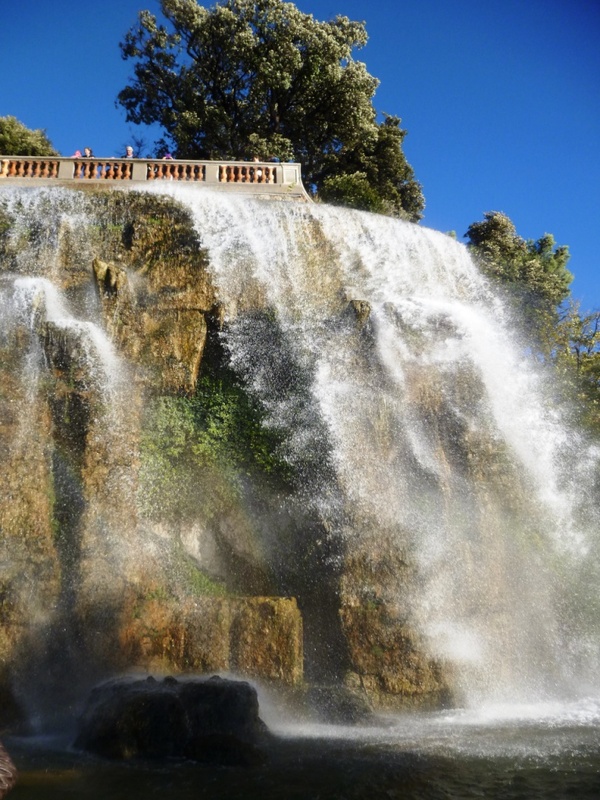 Unfortunately, as I mentioned earlier, the waterfall is artificial as it was built in the 1830s as a draw for tourists from the European nobility to come and visit Nice, a tourism strategy not too far removed from the one which is implemented nowadays. Another alternative to visit the Castle Hill is the tourist train that leaves from the Promenade des Anglais and heads up the hill through the tree-lined pathways, it’s not hideously expensive (unless you are a big family) so could be another option: you can find full details on the official tourist train website. There is also a car park near the top for those unable or unwilling to walk the whole way up. 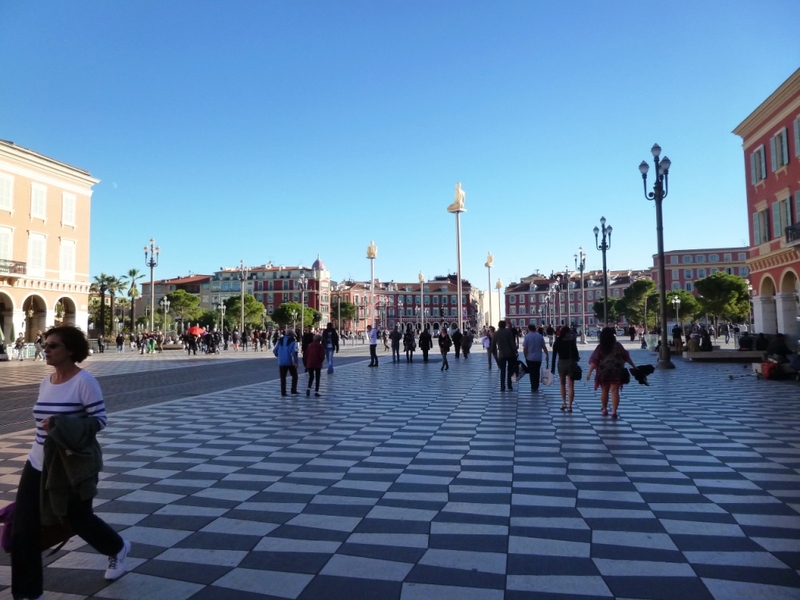 Once you’re done, head down back into Old Nice through one of the footpaths (you need to actually go through the car park) and have a pleasant meal or follow my walking tour of the Old Town. 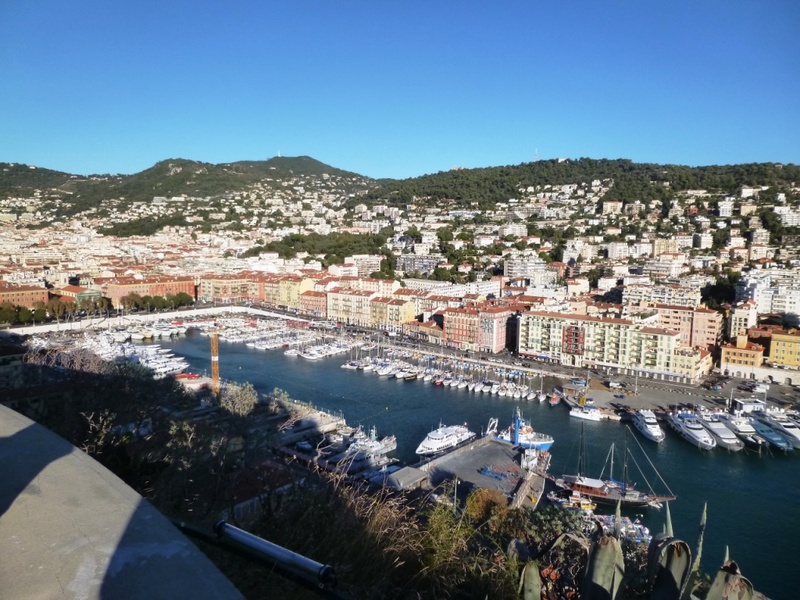 This entry was posted in Nice and tagged Azur, castle, Côte d'Azur, chateau, colline, Cote, family, fountains, french, french riviera, french riviera blog, frenchriviera, frenchrivierablog, hill, holiday, kevin hin, landscapes, leisure, mountains, nature, nice, old nice, paillon, promenade, Promenade des Anglais, promenade paillon, riviera, sea view, seaside, travel, vacation, vieux nice, walking, water. Bookmark the permalink. 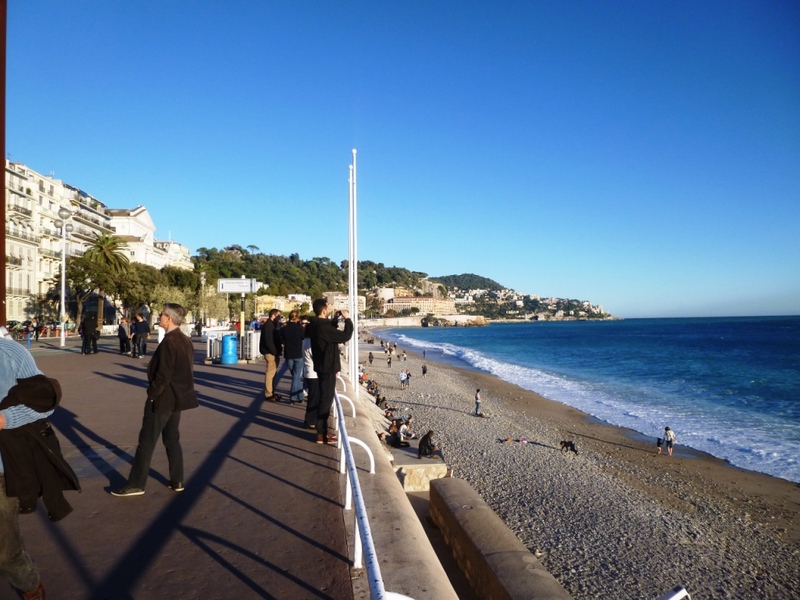 I’ve been reading your blog very faithfully for the past few days and i cannot thank you enough for all these details it has certainly been tremendously helpful because I’m planning a trip to the French Riviera and am thinking of spending at least 1.5 days in Nice. thank you for your generosity in sharing these advice; this blog is a TRUE GEM! 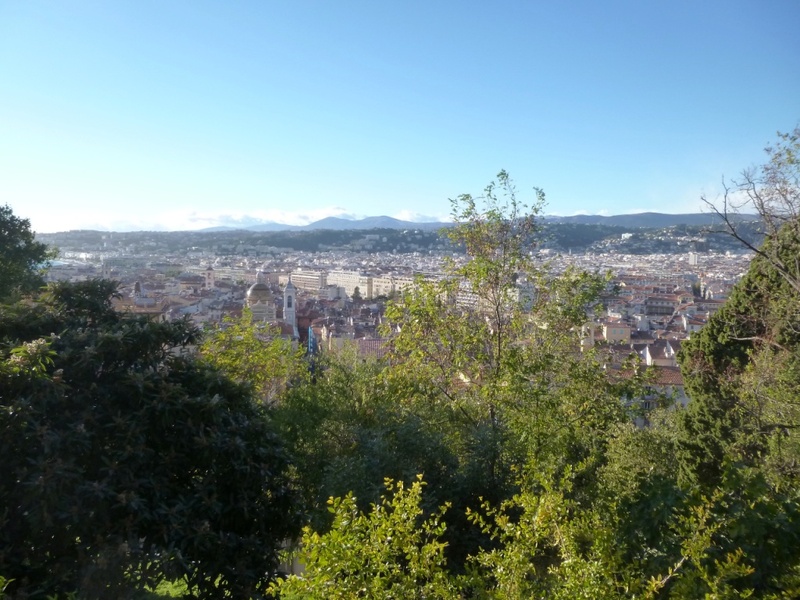 Have read your entries on the walking tour of Nice and also around central Nice; would love to actually take up on all your tips but I’m just wondering how long it takes to do the walking tour if we’re not rushing for time? 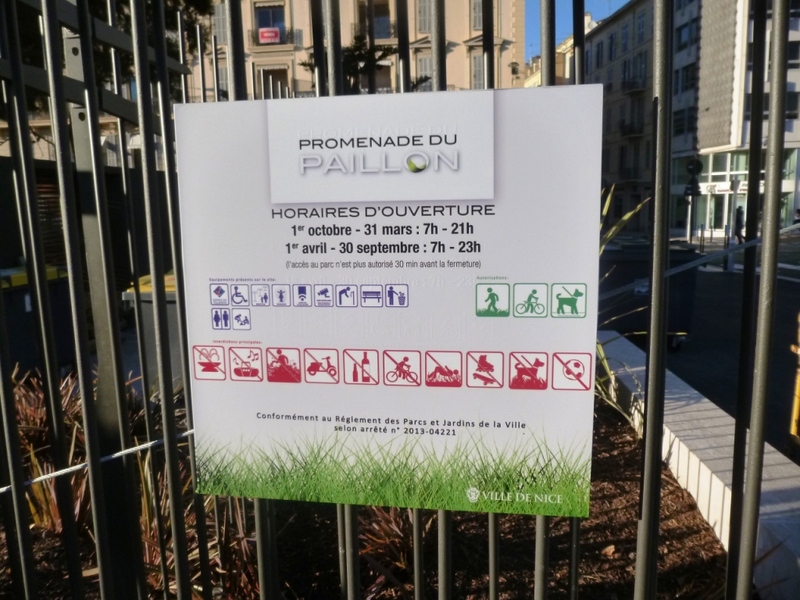 Just needed to know as I’m not sure if I should squeeze visiting the Old Town, the central nice and new promenade du paillon and castle hill etc plus the Promenade des Anglais all into a day? Or just take it easy and spread out the itinerary over 1.5 days?